My father and brother had recently died and both of our sons appeared to be in committed relationships. Our 30th Anniversary in June of 2005 seemed like a great time to invite my sons and their wife/fiance and my widowed mother to vacation with us in Kapalua. 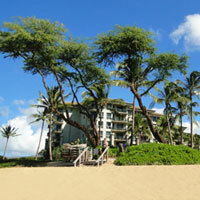 We got a great golf villa in Kapalua, right above three amazing beaches, rented 2 cars and dove right into island life. Daily we hit the beaches: Kapalua Beach for amazing snorkeling and calm waters, Oneloa for boogie boarding or surfing and Flemming Beach for a bit of both. 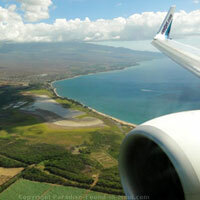 We soaked up the sun and the culture and when the mood hit us headed to Lahaina, Kaanapali or Wailea for a change of scenery. As my sons love snowboarding and wakeboarding (and the youngest was a trampoline competitor in the Olympics in Sidney 2000) they couldn't wait to jump from the rocks at Black Rock in Kaanapali. As they were throwing their doubles and triples, their girls were below in the water playing judge. For dinner, we enjoyed many local restaurants including: Cheese Burger in Paradise, Leilani's and a wonderful Sushi restaurant in Kapalua. Sunsets always found us either at the nearest beach or on the lanai of our villa, cameras ready, lips stretched wide over our teeth in relaxed grins. Nine months later my eldest son made me a grandmother for the first time. 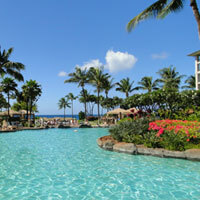 And 2 years later my youngest son and his wife returned to Kaanapali on their Honeymoon with plans to return next month. Awesome story! And thanks so much for taking the time to include a picture... looks like your sons must have been having so much fun there! West Maui is soooo beautiful with tons to see and do! Of course, since I love to eat, and I've heard lots of good things about both Cheeseburger in Paradise and Leilani's, your story reminds me that I'll have to check them out some day.